Shaochilong is the smallest carcharodontosaurid together with concavenator. The animal was 6-7 metres long ,hadshark like teeth and hands with 3 sharp claws. Its name means shark toothed dragon which is a really cool name in my opinion. 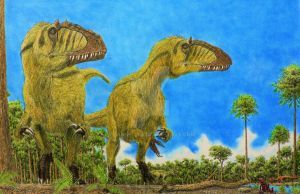 Shaochilong was one of two asian carcharodontosaurus, the other one is Kelmayisaurus which has a length of 11 metres which is almost double the size of shaochilong. liegt wahrscheinlich an dem eingerollten schwanz bei der ersten version. Außerdem war die erste version proportional sehr inakkurat. Der kopf war dort viel zu groß in relation zum gesamten körper.